The previous week saw oil prices climb to their highest levels in four months, with a number of factors contributing to this rise: For one, the US Department of Energy reported a surprising decline in crude oil inventory in the US in the middle of the week. While an inventory of three million additional barrels had been expected, a decline of 3.9 million to 449.1 million barrels was reported. Furthermore, the massive power outage in Venezuela severely impaired the export of crude oil, according to analysts. Meanwhile, Saudi Arabian Energy Minister Khalid al-Falih expressed his satisfaction with the current situation on the oil market to the news agency Reuters, adding to the unplanned supply shortfalls Saudi Arabia’s announcement to continue producing less oil than the Organization of Petroleum Exporting Countries (OPEC) had actually agreed with other major producers as part of its production cuts. Saudi Arabia, the world’s largest oil producer, is considered the strongest voice in the OPEC. A change in production policy therefore seems unlikely at the next meeting of the OPEC+, the extended group of major producing countries, on 17 and 18 April. Around the turn of the year, the OPEC+’s measures to support oil prices were impacted by Qatar’s withdrawal from the oil cartel; however, they subsequently regained their effectiveness. The latest OPEC monthly report shows how production cuts have impacted the oil market, estimating global oil production at 99.15 million barrels per day. With the OPEC states contributing 30.55 million barrels a day, this means a slightly reduced share of total production. 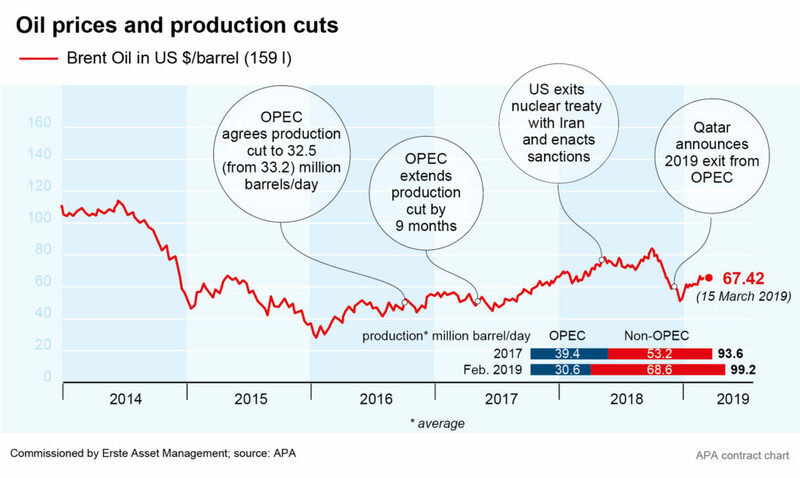 In 2017, the first full year of the agreed production cuts, daily production totalled 92.6 million barrels, with 39.4 million barrels produced by OPEC countries. World production has therefore increased slightly, while the most important countries have significantly reduced their contributions. OPEC expects a global oil consumption rate of around 100 million barrels per day for 2019, indicating slightly lower growth for 2019, as was already the case in the previous year. The reason for this is the weak economy in Europe and North America, among others. The overall picture, however, remains unchanged according to the new monthly report. However, the International Energy Agency (IEA) also published its “Oil 2019” report in the previous week, in which the agency warns of the consequences of increased US oil exports. This would change the international crude oil trade flows and profoundly impact geopolitics, said IEA Director Fatih Birol. In the next five years, the USA will increase its oil exports strongly due to shale oil production, exceed the volume of Russian exports and reach Saudi Arabia’s export level. According to the IEA, the United States could be responsible for 70 per cent of the global increase in oil production over the next five years. With this outlook, a timely end to the struggle over oil prices remains unlikely: while Saudi Arabia and OPEC are determined to keep oil supplies lower, massive increases in exports of US shale oil are expected – which were one of the main reasons for the price drop in recent years to begin with.